Our organic experts at RoT Organics have developed an effective, pet & child-safe organic insecticidal mix that we use with great success in our Texas landscaping business. You can bet if this mix works to kill and prevent the return of our famously tenacious Texas insects, it will definitely work in your neck of the woods too. Best of all, our mix will kill your pests without harming you, your family, your pets, or your friendly neighborhood ladybugs, butterflies, mantises, bees, or earthworms. For more information about our products, visit our products page, or find us on Amazon. 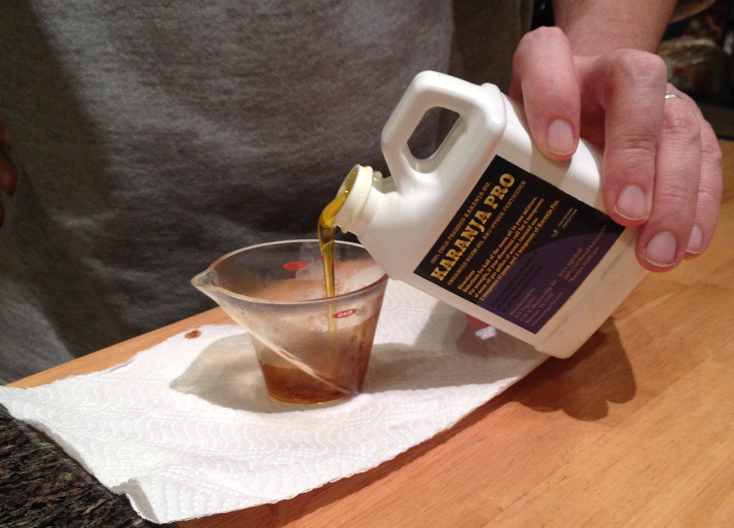 Step 1: Measure 3/4 ounce of Neem Pro 100%. The active insecticidal ingredient in Neem Pro is Azadirachtin, a naturally occurring chemical in the seed of the neem tree. Neem Pro 100% is OMRI Listed for agricultural use up to the day of harvest. 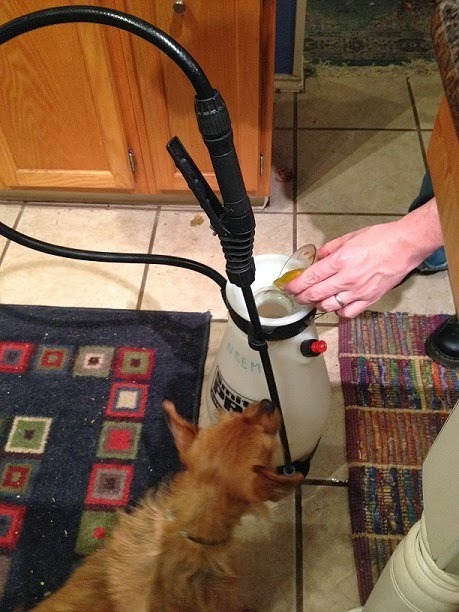 Step 2: Add the Neem Pro into the pump sprayer. Note that all the ingredients for our RoT Organics Pest Control Spray Mix are 100% human and pet safe. Step 3: Measure 3/4 ounce of Karanja Pro. The active ingredient in Karanja Pro is Karanjin, a naturally occurring chemical found in the seed of the karanja tree. Eastern cultures have valued the insecticidal properties of karanjin for centuries. 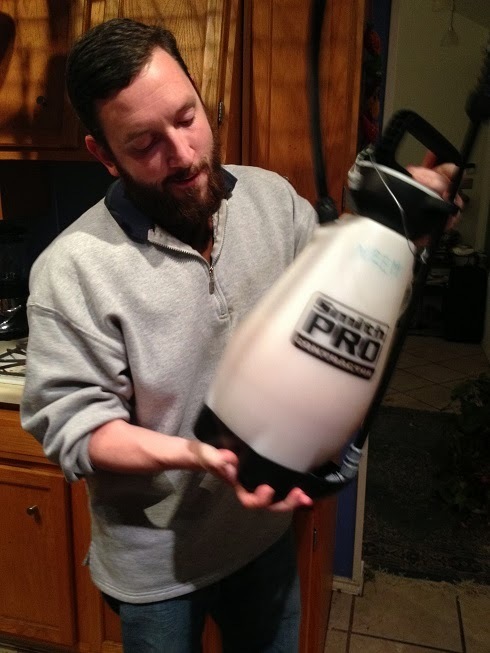 Step 4: Add the Karanja Pro into the pump sprayer. 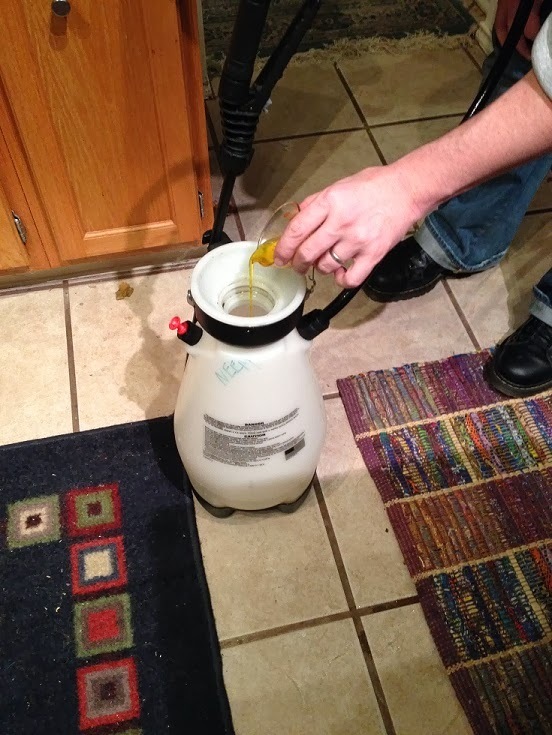 Step 5: Measure 1 1/2 ounces of MOAP, and add it to the pump sprayer. 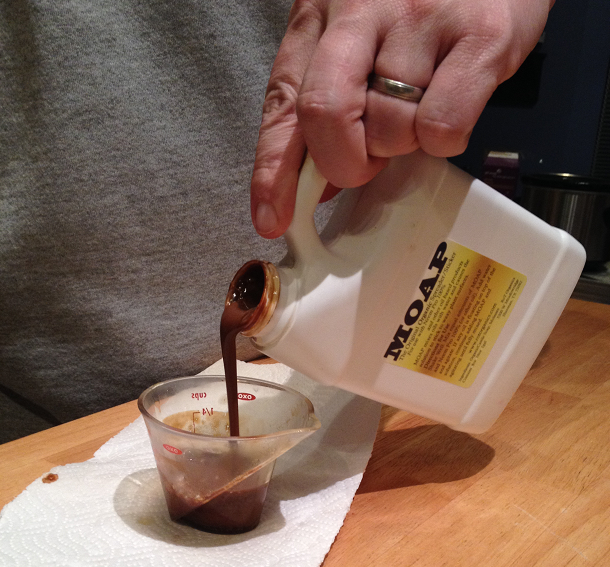 MOAP is RoT Organics’ special mix of high-brix molasses and organic castille soap. 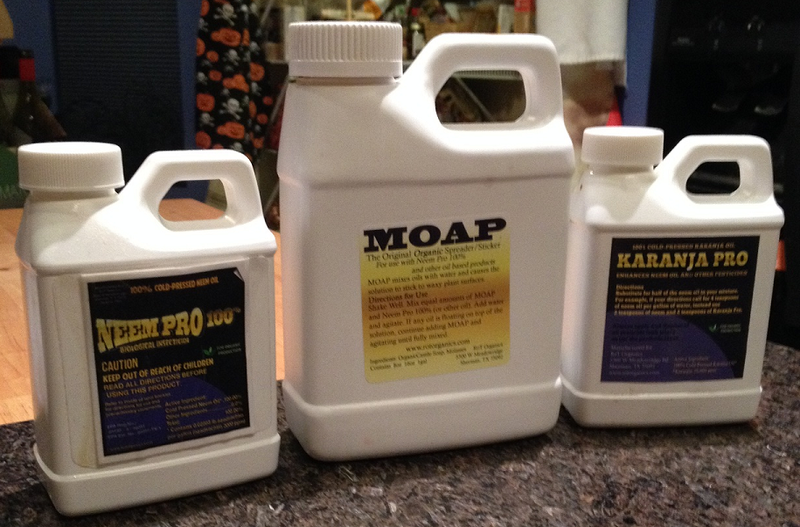 MOAP acts as an emulsifier and spreader-sticker that allows the oils to disolve in water, and then to fully coat all leaf surfaces when applied. 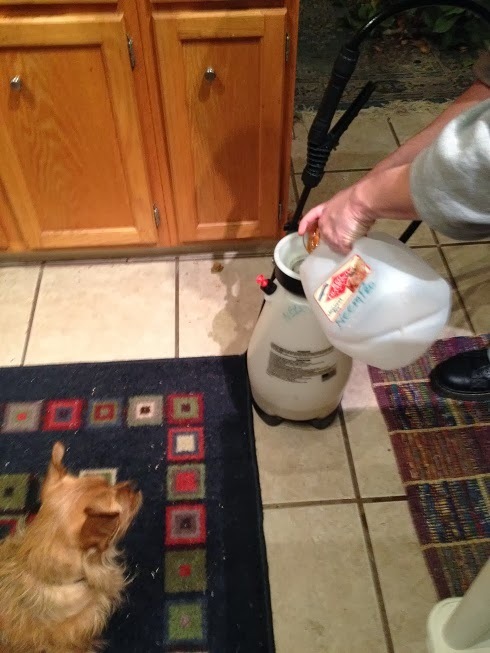 Step 6: Add 1 gallon of water to the pump sprayer. Step 7: Shake it all up! The emulsified mixture should appear light brown and cloudy. 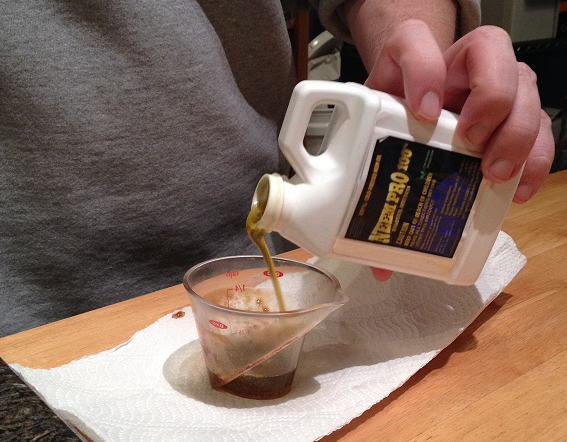 Now you’re ready to spray the RoT Organics Pest Control Spray Mix on all your garden plants! Be sure to coat all leaf and stem surfaces, undersides of leaves, and the earth underneath the plants. If you have a particularly stubborn insect problem you’re working to get under control in the garden, you can double the measurements given in this recipe and spray every 10 days until the problem is under control. Once the insects or fungi are under control, return to the preventive recipe and apply once every 30 days to keep those bugs from entering your garden. Happy organic gardening from all of us at RoT Organics! This entry was posted in Organic Insect Control and tagged Home Garden, Karanja Oil, Neem Oil, Organic, Organic Gardening by admin. Bookmark the permalink.